The shout out in the Avengers Annual was followed by Crazy Harry showing up on a splash page of The Spectacular Spider-Man along with Zonker Harris and Mike Doonesbury from Doonesbury. (Holy crazy crossovers, Batman! To someone who had been homeschooled by Stan Lee through the monthly Marvel offerings and who had tried right out of college to get a job at Marvel Comics, this was indeed heady stuff.) 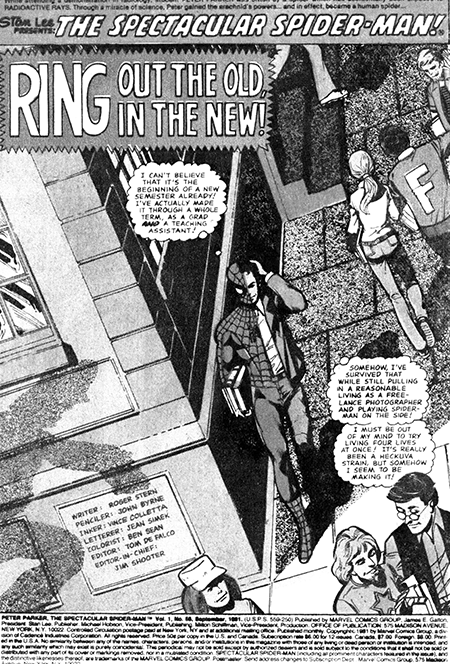 Somewhat later, Crazy Harry would be seen reading a copy of The Uncanny X-Men in the Funky universe (page 410, June 8, 1980). In a crossover with our own universe, Cathy and I appeared in a Funky Sunday (page 330, December 10, 1979) as we waited in line to see a Star Trek movie. But the most wrenching change would come on March 25, 1979, when the cast of characters from ratings cellar dweller Channel One was spun off into a new syndicated strip called John Darling with a growing universe of characters all its own.